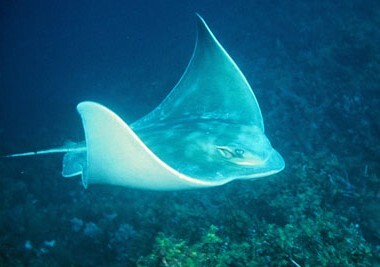 Habitat: This species of ray is regarded as a pelagic species. It can normally be found in shallow waters of 100 - 200 metres. Bait: This species can be caught on sardine or a fillet bait, it's diet in nature is mainly Molluscs and crustaceans. Fishing Strategy: This species can grow very large, so strength and determination is needed to land larger specimens. Other Information: Eagle Rays are live bearers.